We invited Chantelle Nicholson on Facebook Live to share one of her favourite chicken recipes in the first of a series of cooking master class brought to you by Vitality and Great British Chefs. At Great British Chefs, we’re able to pick the brains of world-class chefs to get their recipes, tips and advice on anything to do with food and cooking. This year, in association with our healthy cookery partner Vitality, we want to bring the experts to you direct through our Live and Cooking campaign. As a member of our foodie audience, you’ll have access to our live cookery demonstrations, broadcast on our Facebook page. 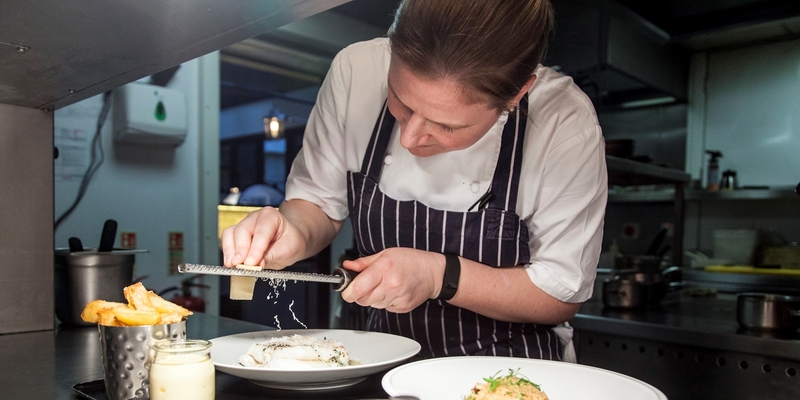 To kick things off, we enlisted Chantelle Nicholson – chef-patron of Marcus Wareing’s Tredwells restaurant in London – who shared one of her healthy, delicious chicken recipes. Instead of using salt to add flavour to the dish, Chantelle unearthed the secrets to alternative seasonings, as well as demonstrating how to pickle, roast and chop like a pro. She also showed how to add ingredients and flavour combinations to the recipe, so you can really make it your own. Chantelle is a keen advocate of healthy eating and believes cooking from scratch is one of the best ways to maintain a balanced diet. Her menus always cater for those with food intolerances or allergies, and she's always looking for alternative ways to season, sweeten or cook dishes for a healthier end result. Take a look at the video below if you fancy cooking the dish yourself.